The staircase is one of the essential features of a house — at least, any house with more than one level. But it has the potential to be much more than just a structural element. Because it is physically and psychologically at the centre of things, it can provide a major design statement in a home. From the most rudimentary ladders and earthen steps of ancient houses, staircases have always been, first, a way to provide access from one level to another, and the basic components are simple and universal: treads (the horizontal boards), risers (the vertical boards), stringers (the zigzaggy side pieces), and railings (which, in turn, consist of vertical pickets and horizontal handrails). If the course of the staircase is long, a landing provides a moment of rest before you continue; it also allows the stair to take up less lateral distance, since it can accommodate a change in direction. Stairs can run next to a wall, or rise through the centre of a shaft (or in the open). If space is really tight, a spiral staircase can wind upwards either inside a stairwell, or protect users with a railing. Building codes have clear standards governing safety, structural soundness, and proportions, which have evolved over time. Despite all these restrictions, architects and designers frequently see the staircase as a real opportunity for creative expression, as the central structural component of a house. While certain dimensions are immutable — railings, treads, and the size of the rise, which has to match an average footstep — there’s room for variation in width, shape, placement, and of course, materials. And there’s also plenty of opportunity for design gestures, which can turn an ordinary household feature into art. One recent example he points to is a stair in a Cabbagetown home, with custom-sized and specially lit art niches in the walls for the client’s sculpture collection. The staircase’s central location makes it a perfect way to bring light down through the interior of the house. O’Connor and his team almost always place a skylight in the roof directly above stairs and frequently, side windows bring in light and views that offer a unique perspective. Even in planned-community homes, many developers offer a selection of choices, particularly for finishes and details: metal or wood pickets (often, in a selection of decor styles), different types of wood for treads and other elements; a choice of carpeting, stair runners or hardwood steps. At The Winslow, a new Lawrence Park condominium project with 68 units, Devron Developments pays homage to the importance of stairs and everything is customizable. And they serve an important esthetic and formal function, he says. The railing design at The Winslow mimics that of the Juliet balcony on the exterior of the home. And the space below the stairs, which is adjacent to the kitchen, has been carved out to provide extra pantry space. The stairs themselves are designed to have a gentle rise and an elegant flow, Safapour says. The visual impact of staircases can’t be under-estimated. Along with finishing materials that might match or create a sense of harmony with the rest of a home’s interior, it’s important to consider where the light falls in your house; privacy concerns (do you want it to conceal or overlook other levels? ); your lifestyle — do you entertain frequently, in which case stairs may help organize or allow for larger volumes of space? Do you want the stairs to be a major design feature of your home, or to fade into the background? And what views — interior and exterior — do you want to highlight? For a house on the lip of the Moore Park ravine, Basis Design Build’s O’Connor created a sequence of glass walls rising almost the full height of the staircase. This offers a leafy view, which in winter becomes a long-distance vista through bare branches. The accompanying staircase is similarly light and transparent, with streamlined railings of steel and perforated metal, open risers and reclaimed wood treads. In fact, risers are not required by code, although the measurements and specs for open (riser-less) stairs are quite specific. Modern architects frequently choose this alternative as a simple and effective way to visually lighten the staircase and increase light transfer. However, it does mean taking care to make the staircase extra strong. “In many ways, making a staircase has a lot in common with making a fine piece of furniture, but it has a lot of requirements a dining table doesn’t!” O’Connor says laughing. 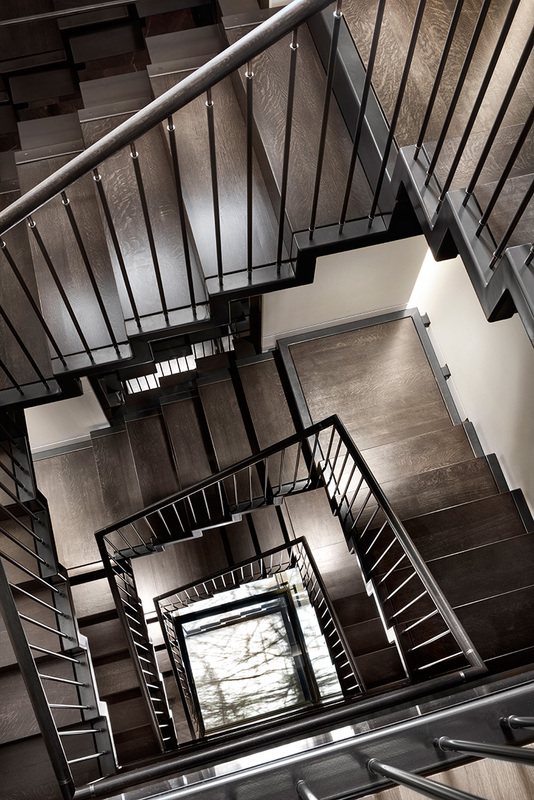 Stairs can be utilitarian, or a piece of art, says Christian Huggett, vice president – development, of Podium Developments, which is building four luxury detached homes on Glen Edyth Drive in Toronto’s South Forest Hill. For a house in Hogg’s Hollow, O’Connor did just that. He designed an artistic variation on the open-riser concept: individual boxes attached to the stringers, but not to each other, allow light to penetrate between steps, and the entire apparatus “floats” an inch or two free from the side walls (or, for part of the course, the steel and brass railings). The secret lies in the zigzagging stringers themselves, which are made of steel and are so sturdy the staircase never so much as trembles when walked on. One of the most dramatic staircases in O’Connor’s portfolio is one in a Rosedale home that splendidly illustrates how it can be a central part of the action, not just a route from one place to another, however pleasant that may be.